Julia and Sam during harvest PHOTOS PROVIDED BY ASTER FARMS. I’m fortunate to have real farming in my blood from growing up on my family’s Demeter / Bio-dynamic / Organic / Gentleman’s farm in Morris Township, New Jersey. The idea and concept of using soil as an extension of the interactive, living earth with the planets above, pulling the entire thing together in a cohesive and forthright manner, is very personal to me— even though my part in the whole thing was very limited. But the concept of farming cannabis attracts my attention because it’s real. Farming, whatever you are growing is massively hard work. There’s no sleeping-in “because I’m tired” days. No days off. While growing up, my responsibility was to care for a working stable with very demanding horses. Horses eat 24/7. Their stalls need to be cleaned constantly, it’s just what you do. That was my job. School was part of the story, too. It wasn’t easy for me, far from. There’s always a job to do on a farm. Read More Here At Forbes! Covering cannabis at the top of the line in quality, and all within the journalistic side of the cannabis business has certainly opened my taste-buds to a broad array of flavors and ‘terroir’ that I thought only existed in the wine world. It’s truly eye-opening to imagine all that time that I spent tasting fine wine growing up, only to discover in later years a much broader array of flavors like wine, inherent to cannabis. I discovered many similar attributes to fine wine, and vice-versa. Descriptors such as crushed minerals, fruit salad, pine forest, sap, salt-slicked could all mean different impressions of fine wine from around the globe. Now imagine taking those same and even more descriptive language when it comes to cannabis tasting notes. Such as the new catch phrase, terpenes. Imagine my delight to fall into a series of samples from Bayflower in San Francisco. Not that I was in San Francisco, (I wasn’t), but close enough in Eureka (a few hours up the coast), is where I experienced their own unique terroir; quite literally, the taste of the place. Here I had in at my disposal some of the most gorgeous locally grown, (legally, of course) cannabis. And suddenly as if by osmosis I had several lovely new samples from Bayflower! Wonderful! Thank you! Perhaps it was the Lemon Tree strain of Cannabis from the California Bud Company seducing me at that very moment, with her hauntingly woodsy, citrus tinged aromatics, further scintillating inhalations, each one offering deep rips of iChing level intellectualism, the experience leaving a perfumed moment in your heart that is deeply mesmerizing. Each subsequent puff offering hints of cedar wood, dripping with raw honey and crushed fall leaves and more sweet and spicy citrus oil that coats your lips and tongue. Coming into view are scents of the very tips of young pine needles as you brush up against them. Their Douglas fir scented sticky oils, releasing their perfume all over your shoes and socks, while being gently crushed under foot. Yes that is what enticed me to share their deep success and their utter excellence, thank you all for making it so and placing those memories into my brain. It’s made my food journalism even more satisfying. WE MADE IT TO FORBES! …And it’s a love letter to the Bull Run Lifestyle. In a land far away in New York City, where people are awoken by car horns, have their clothes professionally cleaned and check the DOW industrial average while brushing their teeth, they dream of a simpler life. To them, the Oregon lifestyle is a fairy tale. The sap that comes from our trees is a thick and vibrant viscoses that courses through the veins of our forests, gushing with life. Our air is crisp and clean, with the soft, rustling sounds of leaves and animals rolling in the gentle breeze, and everything that is grown and cared for is nurtured by the love and light that keeps our land going. And, according to Forbes writer Warren Bobrow, our cannagars capture it all. While some people recovering from substance abuse do best with a zero-tolerance policy regarding any intoxicant, others are able to safely use cannabis. I’m one such person, and my life is all the better for it. In Humboldt County, California, near some of the most beautiful outdoor cannabis farms in the world, I sat with friends in a loft in the town of Eureka and sipped a delicious drink. There was no alcohol in the grapefruit infusion. There was, however, cannabis in the mocktail; it was created by mixologist Warren Bobrow, author of Cannabis Cocktails, Mocktails & Tonics: The Art of Spirited Drinks and Buzz-Worthy Libations.While he still enjoys wine with dinner, Bobrow says he’s just about quit hard liquor since diving into the world of cannabis cocktails, which he began exploring after getting arrested for smoking a joint in New York City during the Giuliani era. “If you smoke a joint in public, everyone knows your business,” Bobrow says. “But not if you are sipping a gorgeous Vietnamese Iced Coffee with THC-infused condensed milk on a steaming hot day, watching your coconut water ice melt slowly into the unctuous concoction. Do I have you here?” While the world has become a friendlier place towards cannabis users since Giuliani was mayor, yes, he did have me there. Read More Here At MerryJane! I’m fortunate in this journalism world to be able to find interesting and intellectually driven people who work within the cannabis space. Entrepreneurs who are every bit as nerdy and metric driven as myself, with myself, less metric driven. Just one of those things when you’re comfortable being different than the norm. Cannabis attracts all sorts of intriguing people and Darren Gacicia is definitely up there with the entrepreneurial minded. I came across Darren in a circuitous manner. His PR for the Garden of Eden line of exceptionally high quality cannabis oil products had contacted me on a different project. She saw my manner of interviewing, it is somewhat different than the other kinds that are out there, that is for certain, and we pushed forward on this discussion. The questions followed along with phone time. But what I really was intrigued about was the fact that Darren grew up in the near proximity to myself, and he went to prep school at the other prep school in my town- for boys; The Delbarton School. Which I grew up, directly next door to, thus my deeper interest in Darren’s deep success and especially that he graduated from an extremely conservative, Catholic, Private Boys School. The only other people who I knew at Delbarton, were my cousins (not Catholic) and a handful of others over my Morristown-Beard years in the 1970’s. I really hadn’t thought about Delbarton much in some time and this nerdy factoid certainly caught my attention! Without further interruption, may I introduce to you, someone who is obviously doing exactly what he loves in life. I cannot find anyone more passionate than Darren Gacicia, obviously doing what he loves in the cannabis industry. Hard working too. No one gets to be a financial go/to for a capitalized corporation without being just a bit more than smart. Warren Bobrow, @WarrenBobrow1, the Cocktail Whisperer, shares to us his cannabis cocktail recipe named John Bartram’s Garden Punch. This cannabis recipe is found in his book, Cannabis Cocktails, Mocktails & Tonics. You may have tried a garden-variety garden punch before, but I guarantee you’ve never had anything like this unorthodox take on the classic mid afternoon refresher. This cannabis cocktail recipe is spiked with a cannabis-infused simple syrup that’s best made with a Sativa strain such as Exodus. Read more here at Ganjily! Create your own cannabis infused cocktails!Combining cannabis and cocktails is a hot new trend, and Cannabis Cocktails, Mocktails & Tonics shows you how. Featuring a collection of 75 recipes of cannabis influenced cocktails and drinks; The Cocktail Whisperer Warren Bobrow will show you the essential instructions for de-carbing cannabis to release its full psychoactive effect. Learn the history of cannabis as a social drug and its growing acceptance to becoming a medicinal. Look beyond cocktails and create successful tonics, syrups, shrubs, bitters, compound butter and exotic infused oil to use in any drink. Start your day with coffee, tea, and milk-based cannabis beverages for healing and relaxation. Get your afternoon pick-me-up with gut healing shrubs and mood enhancing syrups. Make cooling lemonades and sparking herbal infusions to soothe the fevered brow. Then, have an after dinner herbal-based cannabis drink for relaxation at the end of a good meal. 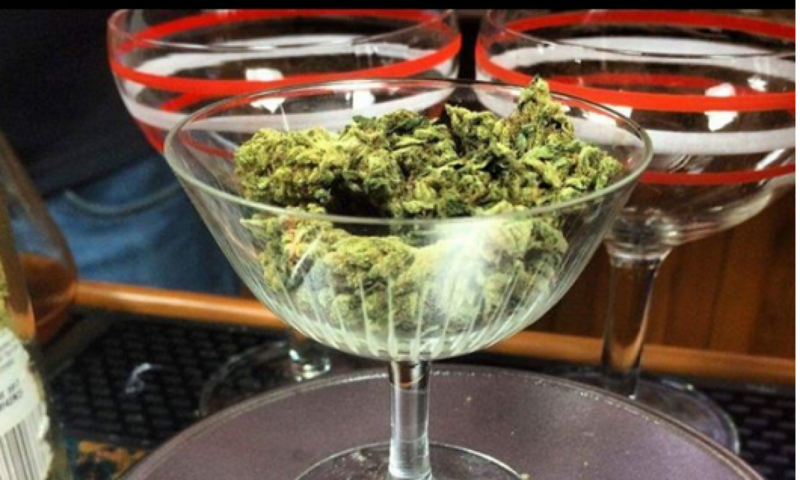 The options are endless with Cannabis Cocktails, Mocktails & Tonics! Warren Bobrow is the creator of the popular blog cocktailwhisperer.com and the author of Apothecary Cocktails, Whiskey Cocktails and Bitters & Shrub Syrup Cocktails. Warren has taught classes on spirits and cocktails all over the world, including an advanced class on rum at the Moscow Bar Show. He has forthcoming research being published in the History of Food and Drink of New Jersey by Wiley Publishing. He has written a book called Cannabis Cocktails, Mocktails and Tonics, featuring a collection of 75 recipes of cannabis influenced cocktails and drinks. The book will help you learn the history of cannabis as a social drug and its growing acceptance to becoming a medicinal. It will also help you create tonics, syrups, shrubs, bitters, compound butter and exotic infused oil to use in any drink. With all of that in mind, we needed Bobrow to shed some light on some of his smoking music with a Weedsday playlist. Terra Carver, the eloquent and peaceful Executive Director of the Humboldt County Growers Alliance is waxing poetic about the fine wine-like Terroir of craft cannabis to a group of broadly smiling Canna-Tourists. They are smiling and utterly enraptured by the gleaming, sunlit day, the long-tables groaning with hand prepared, fanciful appetizers and locally crafted Humboldt artisan breads and oozing, succulent cheeses. They sit enveloped by the aromatics of some of the finest craft cannabis that is grown anywhere in the country. Truly the taste and the aromatics of the place surround and deepen each breath. An experience so overwhelming that most people have never seen anything like this before and they sit, awestruck in the face of such beauty. This is a Victory Garden of outdoor growing. An experience of the the ‘highest’ order, and it is what we have come to see at Dave and Lorelie Sandomeno’s Sunrise Mountain Farm. Row after row of this lusciously scented craft cannabis fills the eyes and the nasal passages with vast bursts of spicy profusion. Terra is explaining with a smile, how the craft cannabis business is certainly to overtake fine California wine in overall sales in just a few short years. But can they accomplish what wine has accomplished with Terroir? That is her goal, to create an overall quality level that demands the greatest price, just like wine demands. In fact in the couple of years that her organization has been guiding local cannabis farmers, they have attracted the attention of the statewide organization, The California Growers Association.